Seychelles Beach Tropical Weddings and Seychelles Beach Honeymoons on Mahe Island. Our beach bungalows are set in an intimate tropical landscaped garden just a step away from the secluded beach of Anse Forbans, where you laze away your honeymoon on the beach in the sunshine or snorkel at your leisure. Chalets d’ Anse Forbans is a small family run establishment that pride themselves on making your Seychelles honeymoon an affordable and truly memorable experience. 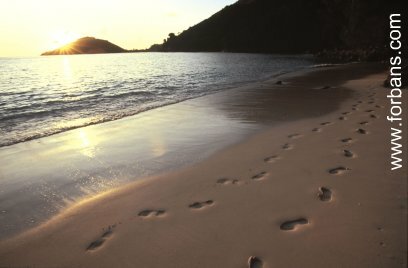 Your ideal honeymoon destination is the Seychelles.. Your ideal honeymoon retreat is Chalets d’ Anse Forbans. View our Seychelles Wedding and Honeymoon Pictures on our Flickr Account for further information on our Seychelles Weddings. 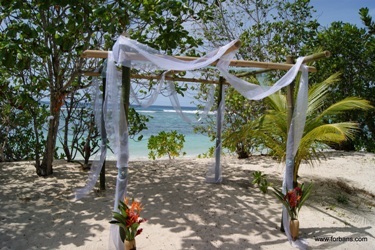 Chalets d’ Anse Forbans offers the ideal Seychelles Wedding Venue. White sandy beaches, swaying coconut palm trees, lapping ocean waves – Your dream wedding venue in the Seychelles. Chalets d’ Anse Forbans offers you the unique wedding venue of our Creole style gazebo located in our tropical garden and just a step away from the beach of Anse Forbans as an ideal venue for your dream day in the Seychelles. Our Creole gazebo is made entirely from local palm trees to blend into the natural tropical environment. 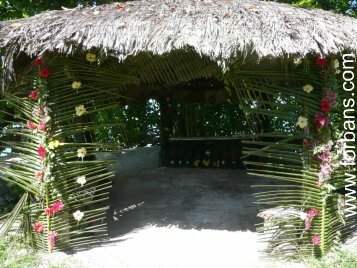 The roof is made from the leaves of the palms while the supporting structure is made from palm trunks and the floor is covered in the talcum powder beach sand of Anse Forbans. Seychelles Wedding Package: Coral Hibiscus - This package includes the organisation of your Wedding Cake, Wedding bouquet of local flowers, decoration of the beach gazebo with local flowers, table cloth, local tropical display item for rings (for keep sakes) local customary good luck token, arrangement and payment of all legal documents, arrangement of a Seychelles photographer as well as someone to produce your Wedding video. On arrival in the Seychelles a meeting with the organiser @ Chalets d’ Anse Forbans can be confirmed to finalise the wedding preparations. Chalets d’ Anse Forbans will also provide a witness for your wedding to be present. Chalets Anse Forbans will do the set up of the Beach Gazebo with local flowers and organise the final clean up after your wedding. We are always here to help and we will do our best to tailor our packages to meet your requirements. 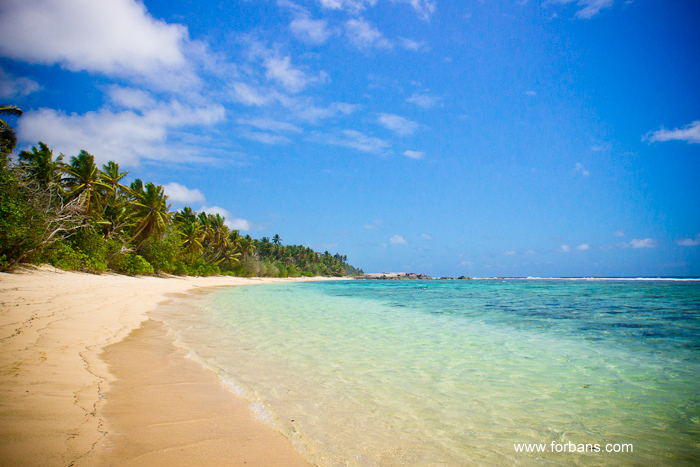 Why not request for a quote with Chalets d’ Anse Forbans for your Seychelles Wedding. 1. To get married anyway in the Seychelles the intended couple must both be 18 years old or over. 2. If you wish to organise your own wedding in the Seychelles you must apply for a civil wedding license at the Seychelles Civil Status Office in Victoria. This is easy to obtain once you have all the required documents listed further down. 3. It is advisable that the wedding is planned and documents gathered at least six weeks before your planned date to allow for the processing in good time, but you can fast track it with a "special license." 4. Couples should advise the Civil Status Office in Seychelles of their proposed wedding at least eleven days before the chosen date. However, this 11-day period may be partly waived by applying for a special licence, which can be issued within two days from the date of application. 5. The couple must be resident in the Seychelles for at least 3 days prior to the civil marriage under this special licence. 6. Weddings in Seychelles may be conducted anywhere approved by the Civil Registrar. So if you have any special place in mind, first seek their approval. You can plan a wedding at Chalets d’ Anse Forbans using the Creole Gazebo if you so wish. 7. If you wish to marry outside the Seychelles Civil Status Office you are required to pay a fee in Rupees. This fee applies to weddings held on any weekday on Mahe. 8. A premium fee is charged for weddings in Seychelles held on Saturdays and Sundays, or after 1700hrs on weekdays. 9. Legally conducted Seychelles weddings are recognised under European laws. 10. Any nationality can get married in Seychelles, but check with your own country's requirements first. 11. Except for British nationals, all nationalities require a special stamp (apostil) from the Supreme Court of Seychelles to validate the marriage certificate obtained after the civil wedding. You can get your marriage certificate "apostiled" at the office of the Registrar of the Supreme Court of Seychelles in Victoria. You have to go pick it up two days later and a small fee is charged. · Their original Birth Certificate or a certified copy. · If divorced, a decree of absolute must be produced. · If widowed the death certificate of the former spouse along with the previous marriage certificate. · Legal proof in the case of a name having been changed. Legal proof must also be supplied by a formerly married woman who has reverted back to her maiden name. · Copies of the first 2 pages of valid passports held by both parties. 13. All the above documents must be originals or copies duly certified by a notary or solicitor before departure from your home country and where necessary they must be translated into either English or French and the translation certified as correct and a true translation by a notary or solicitor. 14. Special Note for French nationals: Under French law, those who wish to get married abroad must follow certain specific procedures. For information concerning these procedures, contact either the Seychelles Civil Status Office or the French Embassy in Seychelles or your local municipality before leaving home, if you are a French national. Note: Church weddings in Seychelles cannot take place without a civil legal marriage first.